Why are investors scared of these movements in the banking sector? Surely, there wasn't a financial sector shareholder alive on April 13 who didn't already know that big U.S. banks, (a) had botched a bunch of mortgage foreclosures, and (b) would be forced by regulators to spend a lot of money fixing them. So this sell-off of major bank shares when regulators announced that, yes, the banks will have to pay something for those mistakes, is particularly baffling. The PNC Financial Group (NYSE: PNC) rode the slide with the rest of the sector. But with YCharts Pro already showing PNC shares as undervalued, the drop just made it a better buying opportunity. PNC certainly hasn't escaped the problems that plague big banks now. The Fed included PNC along with Bank of America (NYSE: BAC) and most other large U.S. banks in its April 13 orders to correct the flawed practices that led to illegal foreclosures. Like its competitors, PNC likely will have to reimburse homeowners for mistakes and pay fines as a result. PNC took a $70 million expense related to foreclosures in the fourth quarter. Management called it a one-time expense, but it wouldn't be too surprising if more charges were needed before this mess is sorted out. Both the banks and the regulators say that could take years. Other reports have been bearish for the banks, too. Several banks have pulled off healthy-looking earnings lately, but they are mainly the side effects of lower bad loan provisions. New regulations recently killed some fees banks very much liked. Real growth is slow. But all of this is old news. For PNC, the general trends are in the right direction, and its shares look like the best bet for investors to make money on banks again. 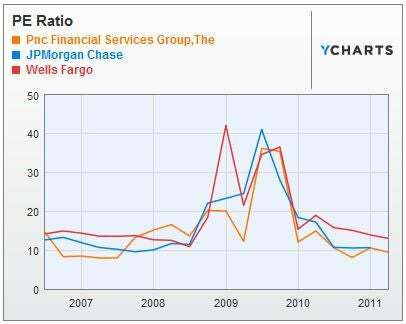 PNC is often overlooked as a recovery play, as investors have favored the better-known Wells Fargo (NYSE: WFC) and JPMorgan Chase (NYSE: JPM). But PNC's shares are a bit cheaper. 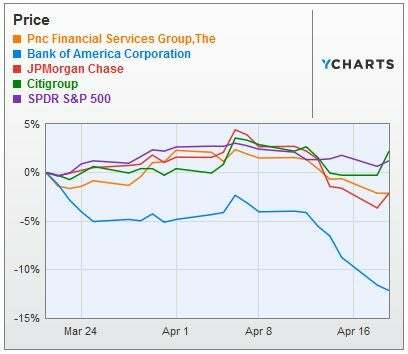 PNC is showing signs of a slightly stronger recovery than some of these bigger banks. 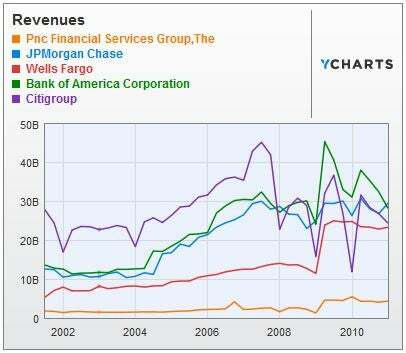 Unlike most of its big competitors, PNC has generally made revenue gains. Management expects underlying growth in 2011. Those gains come mainly from an aggressive strategy to court new customers on university campuses and at their workplaces. While Bank of America raises revenues by squeezing more fees out of customers, PNC is adding to sales by getting new customers. PNC is doing more and more commercial lending. Asset management is also going strong. The company benefits from a 20% stake in BlackRock (NYSE: BLK), the world's largest money manager. Most of the banks posted hefty dividend increases after winning regulatory approval to do so earlier this year. PNC raised its dividend 250%. No one expects PNC, or any of the banks, to come back as a rollicking growth stock in coming months. Mortgage problems will take years to unwind. But with a record of adding customers during a difficult time and slowly improving earnings, PNC likely will be a solid performer in the long run. Dee Gill is an editor for the YCharts Pro Investor Service.